The reviews of the CD are starting to come in now, so here are a few for you! 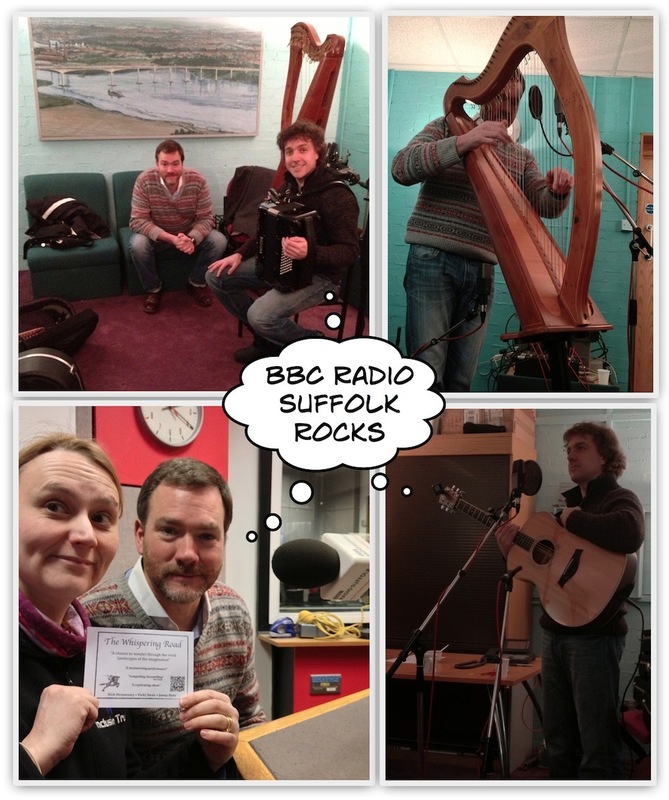 For the past five weeks we’ve also been serialised on Genevieve Tudor’s BBC Radio Sunday Folk Show. If you missed it, you can hear some of the episodes for a little while – but worry not. You can just buy the CD or come and see us live! 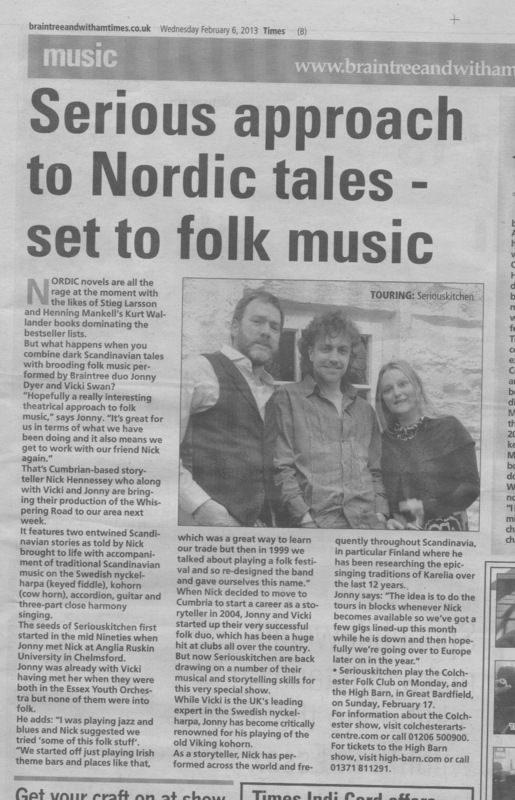 Serious Kitchen are internationally renowned story teller Nick Hennessey and popular internationally well known musicians and singers Vicki Swan and Jonny Dyer who joined up in 2012 to produce the show ‘Whispering Road’. With so much individual talent this trio is bound to make an impact with anything they produce. 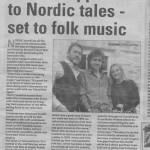 This CD is no exception and it features a story based on two Scandanavian legends with musical and vocal accompaniment. 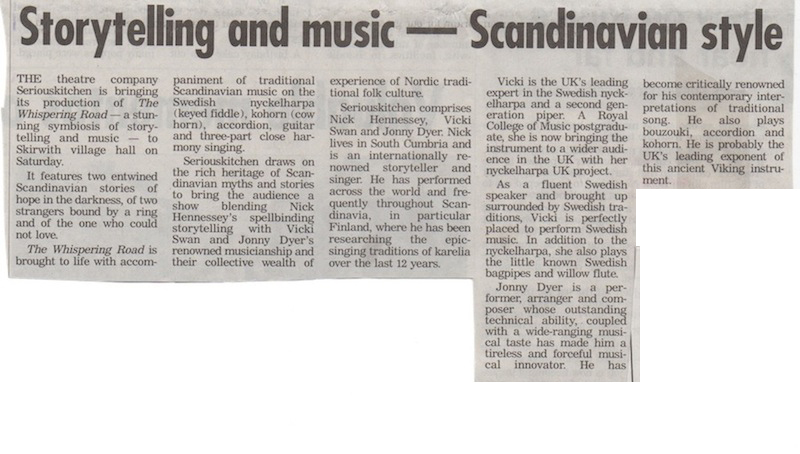 Nick is probably one of the best story-tellers on the folk scene as well as having a good singing voice and Vicky is the UK’s leading expert on the Swedish nyckelharpa and also has a great voice. 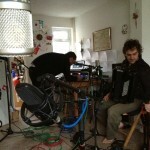 Finally, Jonny is a fine singer and instrumentalist and, on this CD, plays accordion, guitar and kohorn (cow horn!) to great effect. The close harmony singing on this album is also superb. Without wishing to give the plot away, let me just say that the story involves a handsome prince, a beautiful girl, an otter, a raven and a wolf and, of course, trolls! Nick holds the listener’s attention throughout with his excellent characterisation of the participants and the accompanying music provides a very appropriate atmospheric background. Vicky is fluent in Swedish and is therefore very well placed to perform the Swedish songs and words that form part of the story. The one question that came to mind when I was listening to this album was ‘Would it bear repeat listenings once you know the complete story?’ The answer has to be ‘Yes’ because the plot is so involved, the delivery so entertaining and it is quite a long tale too that I’m sure I shall be making a return to it several times in the future. This album is a must for afficionados of traditional tales and will also appeal to those who normally don’t venture into the genre. 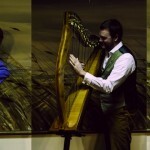 Over the last five years, Vicki Swan and Jonny Dyer have established themselves as one of the most accomplished and talented duos on the folk scene. Another of the performing irons that they have in the fire is giving shows with the master storyteller, Nick Hennessey – and this is Serious Kitchen. The spellbinding long story presented here is of Scandinavian origin – frightening trolls, handsome prince, talking animals – the lot! Nick has a great skill and grabs the attention throughout. Vicki & Jonny provide the music and the singing; sometimes as an augmenting background, sometimes as an interlude and at other times to accentuate important moments in the mounting tension with usually multi-instrumental Vicki sticking to her Swedidh Nyckelharpa for this show and basing much of the music on her roots in Swedish music. The modern storyteller is often a performance artist but even on an album without the visual appeal, this is pretty gripping stuff. Happy New Year to everyone! We hope you all had a great Christmas and weren’t too bothered by trolls! We’re now starting to plan our next runs of tour dates, so do get in touch if you’d like the performance of The Whispering Road to come to a venue near you! We’re also starting to plan a whole new show, watch this space! Lytham Library at 3pm. As soon as we get a definite web link (the date has been put in the diary quite recently!) we’ll post it up here. 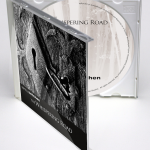 We’re finally there, we have a release date for the studio recording of The Whispering Road. We will be releasing this CD on the 20th November 2015 at the Darwen Library Theatre. To get your hands on it earlier, pre-order your copy now! 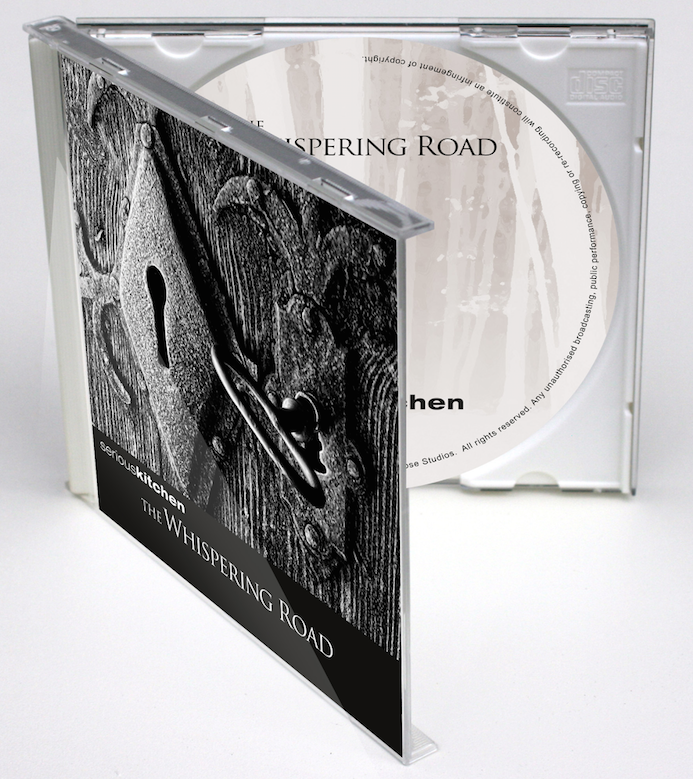 We’re finally really happy to announce that we’re going into the studio on Sunday to record The Whispering Road. 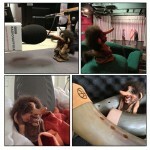 We’ll be doing a video blog from the studio, so watch this space for the fun, frolics and troll slaying as we go. So now we our proud to open up for pre-orders! We’re recording at the wonderful Wildgoose Studios with Doug Bailey at the helm. To get us all into the troll slaying mood (and to help offset some of the studio costs) we’re putting a performance on in the village hall in Wherwell. 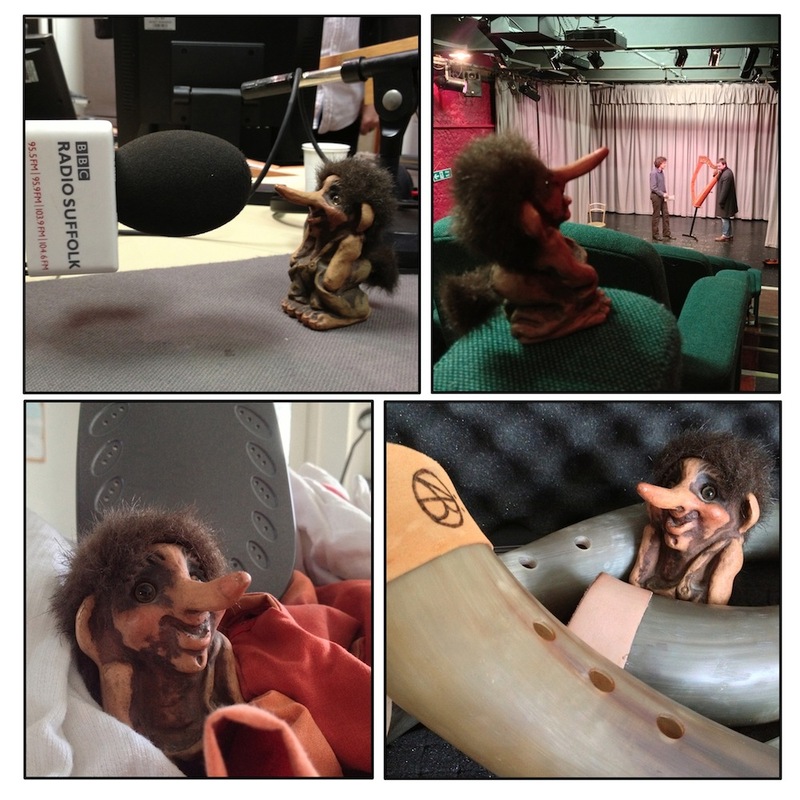 So come along and be part of the recording adventure! Doors open at 7:30 for performance at 8pm. Further details are on the Wildgoose website. We’re about to go out on the road for another mini-tour of Troll slaying! It would be great to see you there! 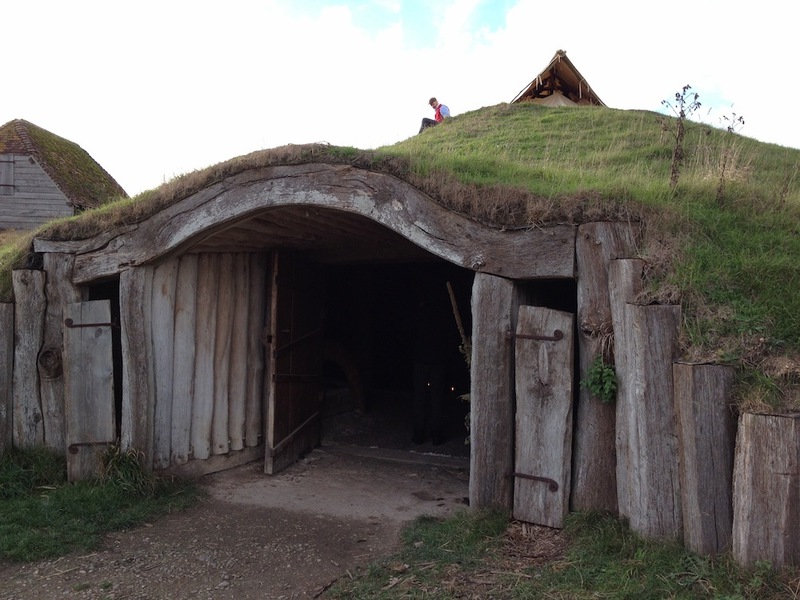 We hope that you’ve all had a great winter celebrations and that the trolls were kept at bay! 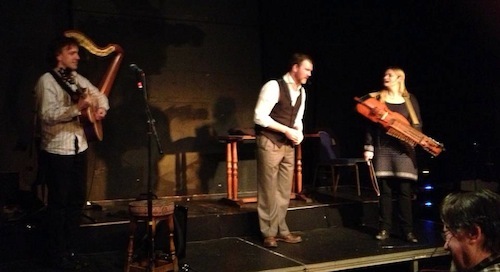 We’re very excited that we’ll be on the road again soon with some wonderful venues! We’re really looking forward to the all. So check out the websites and book your tickets now! I got some internet access whilst on tour, so here is our little video diary-ette from the Ancient Technology Centre. Playing in the firelight was a wonderful experience and Nick made the absolute most of being able to stride around the fire. 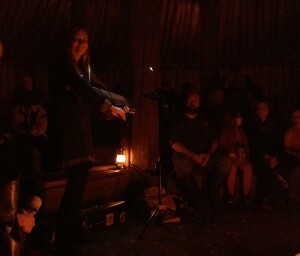 It was the perfect place to slay trolls in and the audience was wonderful. We wish that every performance could be like this one. We made a youtube video and as soon as we get enough bandwidth on tour we’ll upload it for you. 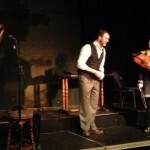 Tonight sees us in Exeter at the Barnfield Theatre. We shouldn’t have to worry about being able to see our instruments tonight. Tomorrow we get to drop off four nyckelharpas at Halsway Manor and then slay some more trolls at the Silver Street Sessions in Wiveliscombe. Then Vicki and Jonny continue on their tour down in Cornwall and Nick heads home again. Come and say hej hej if you’re at one of these gigs! Our first gig is tomorrow and we’re really looking forward to it. Our bags are packed with all the usual troll slaying things and we’re raring to go! Come along and say hello! We’ll take some pictures and report back. We’ve been busy this week with both a photo shoot and a filming session. This is all preparation for future tours. It felt like a good idea to put this at the end of the tour, but we’re all quite tired now from being on the road. We’re waiting for the real pictures and footage to come back, but we put a little camera up at The High Barn and created a time-lapse movie. The sound track is our diddle song. We’ve only got two more dates left on this leg of our Whispering Road tour, so we’re a little bit sad, but also looking forward to a rest! It’s been a pretty mad week here in the kitchen. Not all troll slaying though. Vicki & Jonny are in the middle of dashing around from Kent to Hampshire, then Wales and up to Gloucestershire before running back to Essex to run their Scandi Session at the Swan. Nick had his own solo gig in Essex whilst they were away. A couple of troll incantations were performed outside of the show, just to make sure that everyone was safe and protected! 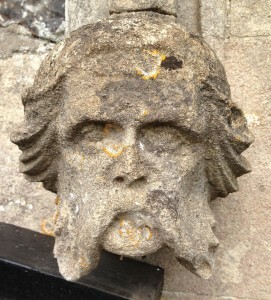 The trolls are still falling thick and fast, but there are plenty yet to find! Colchester, Southend and Ely next week. (Once V&J are back again!) We’ve had a piece published in the local papers (we think you’ll find it in Colchester and Southend and we picked up a copy from our local paper, scanned it and have put it up here for you, click on the thumbnail picture to read the contents! 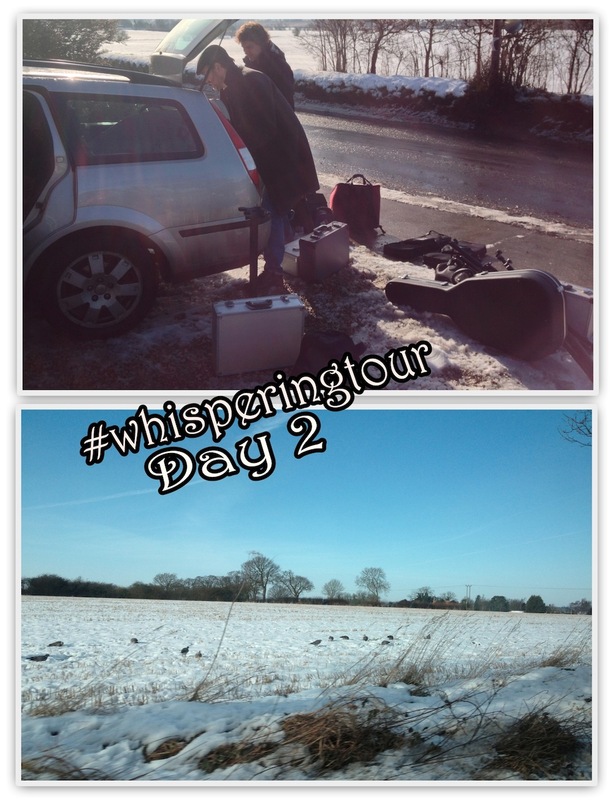 It’s been a hectic few days, playing in Hertfordshire, Suffolk and London. We also took some time out to celebrate Nick’s birthday, chocolate brownie cake, candles and singing. We’ve not seen much of the mornings but what little has been seen has been filled with a little bit of ironing, washing up, Jonny has put up new outside lights, Vicki has been tapping away at the computer and squeaking away at the pipes putting together a new bagpipe book and Nick has been doing something in his room beginning with Z (but not sleeping, not that sort of Z). We’ve had such a great response to the show everywhere we go we keep hearing the words: Stunning – Amazing – Magnificent – we want to see it again! So we’ve added a scrolling testimonial section on the front of our website. Feel free to sent us in your quote from the show and we’ll add it to the pile! We love them all. Vi hade några Svensk i publiken igår kväll – hej tjejer! Det var jätte kul att höra ni skratta innan Nick översätt vad jag sa på Svensk! Kul att träffas! Tomorrow will be the final track we recorded which was Jonny and Vicki singing Broken Token. We’re off to Stortfolk in Bishop’s Stortford tomorrow, Bury St Edmunds on Friday and Torriano Story Night in London on Saturday to round up National Storytelling Week! Day four saw us recording a little radio snippet for National Storytelling week, sat in the front room surrounded by a forest of cables and microphone stands. We’ll let you know when and where you can hear it! Tuesday is a rest day, so we’ll update again very soon! Day two was fun. The promised snow never really arrived so we had a lovely drive through the Suffolk and Norfolk Countryside. Jonny is amazing at packing the car, I have no idea how he fits everything in, but three guitar cases, harp, accordion and nyckelharpa all go in along with three people. The views of the countryside were lovely as we drove further north. Lunch and a crossword at the the Beach Cafe in Wells-next-the-Sea. The Granary Theatre is a lovely little 80 seater venue, tucked away. A very intimate place with a wonderful atmosphere. Well worth a visit if you’re in the area. After the performance it had started to rain and all the pretty snow had gone, which was both a shame and also a relief! We’re down south tomorrow in Walthamstow. See you there! Day 1 was full on packed. 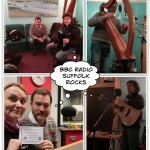 We headed up to the BBC Suffolk radio station to record some tracks and an interview to be played on drive time over the next week. We last played here many many years ago for the old folk show. Good memories! With some time to kill we lunched at a local cafe before heading up to Saxmundham and the wonderful Everyman Folk Club. The new venue was packed out and the atmosphere was wonderful. A really, really great place for our first night. 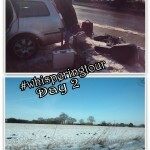 We’re tweeting live from our twitter account @seriouskitchen3 with the hash tag #whisperingtour so join in the conversation! I’ll add photos to this post later, we’re on the road up to Norfolk and Wells-next-the-Sea as I type with one finger on my iPhone from the back of the car! Eight days and counting! We’ve ordered up some wintery weather for this week to get everyone in the mood for for a story from the frozen north, but we’re hoping not too much so that it hasn’t got time to melt again! In the meantime here is our press release from our previews in Cumria.